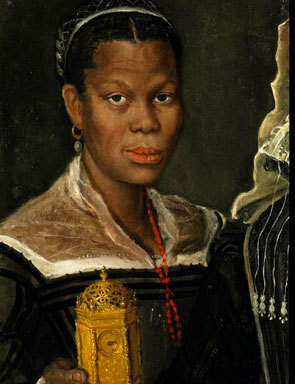 Portrait of an African Slave Woman, painting by Annibale Carracci, ca. 1580, courtesy of the Walters Art Museum. This painting demonstrates Atlantic Creole influences, and how early depictions of Africans by Europeans were not necessarily derogatory before the increase of racial stereotypes with the rise of New World chattel slavery. Europeans colonizing the Americas in the sixteenth and seventeenth centuries frequently brought both enslaved and free African laborers with them, drawn from pre-existing trading relationships in West and Central Africa. The legal and social status of these early Africans in the Americas was generally more fluid than what developed in the eighteenth and nineteenth centuries as New World chattel slavery became more entrenched. In addition, many early Africans in the Americas came from African port cities involved in European trade and later the trans-Atlantic trade. Known as Atlantic Creoles, these Africans had prior exposure to Europeans such as the Portuguese, who had been trading and settling along the African Atlantic coast since the fifteenth and sixteenth centuries. Some Atlantic Creoles had even lived in Europe. Early Atlantic World multicultural exchanges also influenced European identities. For example, Portuguese sailors in African port cities often adapted their Iberian culture to West African contexts, and they became known as Lançados. The offspring of Portuguese and African sexual relationships and intermarriage, who then permanently settled in African regions, became known as Euroafricans. From this prior exposure to African and European influences, Atlantic Creoles in the Americas often spoke multiple languages; practiced Christianity infused with African religious traditions and even Islam; and had experience working with Europeans as interpreters, sailors, merchants, and traders. When slave traders forced them into early American labor systems, Atlantic Creoles could use their familiarity with European customs to negotiate the terms of their status more easily than later enslaved arrivals from the African interior. In this way, a significant number of enslaved Atlantic Creoles in the Americas obtained their freedom, married and had children born into freedom (often with other European settlers), and became property owners, farmers, and even slaveholders. 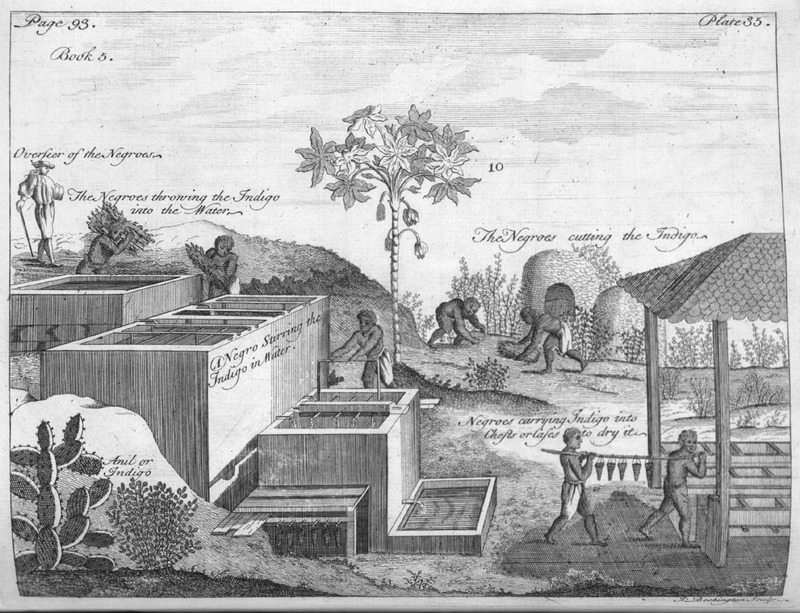 Depiction of indigo manufacturing in the French West Indies during the 18th century, from Pierre Pomet’s work A Complete History of Drugs, 1748, courtesy of University of Virginia Special Collections Library. The market success of plantation cash crops such as sugar, tobacco, rice, indigo, and cotton greatly increased labor demands and solidified economic reliance on slavery. The experiences of enslaved and free Africans in the Americas changed dramatically once plantation agriculture became more established in the late seventeenth, eighteenth, and nineteenth centuries. The market success of plantation cash crops such as sugar, tobacco, rice, indigo, and cotton greatly increased labor demands and solidified economic reliance on slavery. As described earlier, complications with maintaining populations of enslaved American Indians and European indentured servants meant that plantation owners turned to African slavery as their central labor source. The economic success of New World cash crops ensured that plantation owners accumulated more capital to invest in both slave labor and land. Advertisement for "A Prime Gang Of 158 Negroes," Louis D. DeSaussure, Charleston, South Carolina, 1860, courtesy of Duke University Libraries. 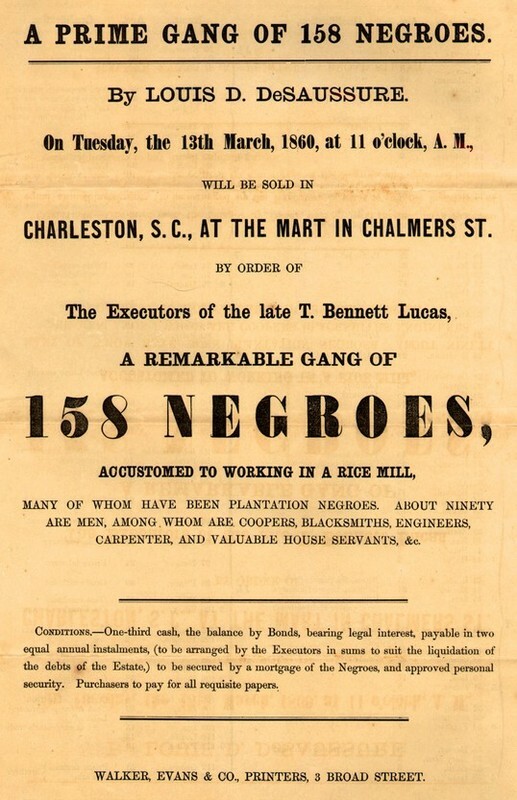 By 1860, "Negroes" implied slaves in this Charleston, South Carolina, advertisement. To fill this growing American labor demand, slave traders in Africa expanded beyond port areas to the interior to obtain more captives. In contrast to earlier Atlantic Creoles, these new African arrivals had less exposure to European customs and languages. While manumission was still a possibility for slaves throughout the Americas, greater cultural differences and communication barriers, combined with greater investments in plantation agriculture and chattel slavery, made it more difficult for enslaved Africans in the Americas to negotiate their labor status. During the eighteenth century, Africans and their African American offspring became the dominant enslaved population in the Americas. In major plantation areas, their numbers were so great that they became the population majority. Though the specific legal rights, social experiences, manumission possibilities, and labor treatment of enslaved Africans varied greatly over time and across different regional, colonial, and economic contexts, the rise of plantation agriculture meant that African slavery became central to many colonial American economies. To ensure their financial success, American slaveholders influenced political, legal, and social systems to limit both the mobility and the possibility of freedom for growing numbers of enslaved Africans and their offspring. They increasingly defended this oppression using false arguments of white superiority, black inferiority, and natural racial hierarchies, and in doing so established institutionalized racism throughout the Americas.